I chose the colors for my Color Affection shawl at Knit Picky. The light khaki and chocolatey brown are both Dream in Color Smooshy and the green is Shalimar Zoe. 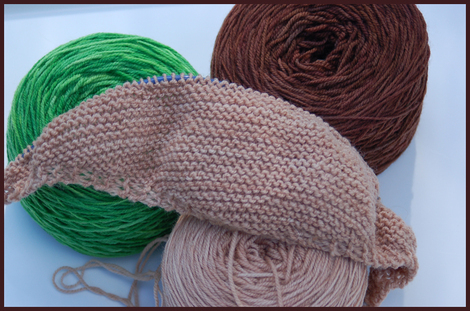 I'm starting with the khaki and then striping with brown before ending with the green. As I looked through the many, many Ravelry projects, I decided I like the ones that start with the neutrals before going into a pop of color. Being a tight knitter, I added a YO in between the first two stitches of every row and then I drop it when I come back to it at the end of the next row. I think my edge would be very tight without this. In quilting news, I'm nine squares into a Converging Corners quilt and I'm not really feeling it. If you follow me on Instagram, you may have seen it (I'm paperstarfish if you don't follow me and want to! ), otherwise I will post a WIP picture in the next day or so. This page contains a single entry from the blog posted on June 14, 2012 7:37 PM. The previous post in this blog was Modern Alphabet and I Meet Tula Pink!.